What is Applied Category Theory? • Tai-Danae Bradley, What is Applied Category Theory? Abstract. This is a collection of introductory, expository notes on applied category theory, inspired by the 2018 Applied Category Theory Workshop, and in these notes we take a leisurely stroll through two themes (functorial semantics and compositionality), two constructions (monoidal categories and decorated cospans) and two examples (chemical reaction networks and natural language processing) within the field. This entry was posted on Tuesday, September 18th, 2018 at 7:02 pm and is filed under mathematics, networks. You can follow any responses to this entry through the RSS 2.0 feed. You can leave a response, or trackback from your own site. 2 Responses to What is Applied Category Theory? The paper (or link) in that book (or paper) ‘Linguistics using category theory’ (CT) by Griffith and Master touches on approaches I’m slightly more familiar with, but there are quite a few different formalisms in linguistics (and some linguists think the existing formalisms deal with ‘ideal’ systems which don’t capture a lot of what language is about, just as many economists recognize that ideal ‘general equilibirum theory’ in economics while a useful model is no more applicable than Boltzmann’s ideal gas model is to all of collective phenomnea in physics). 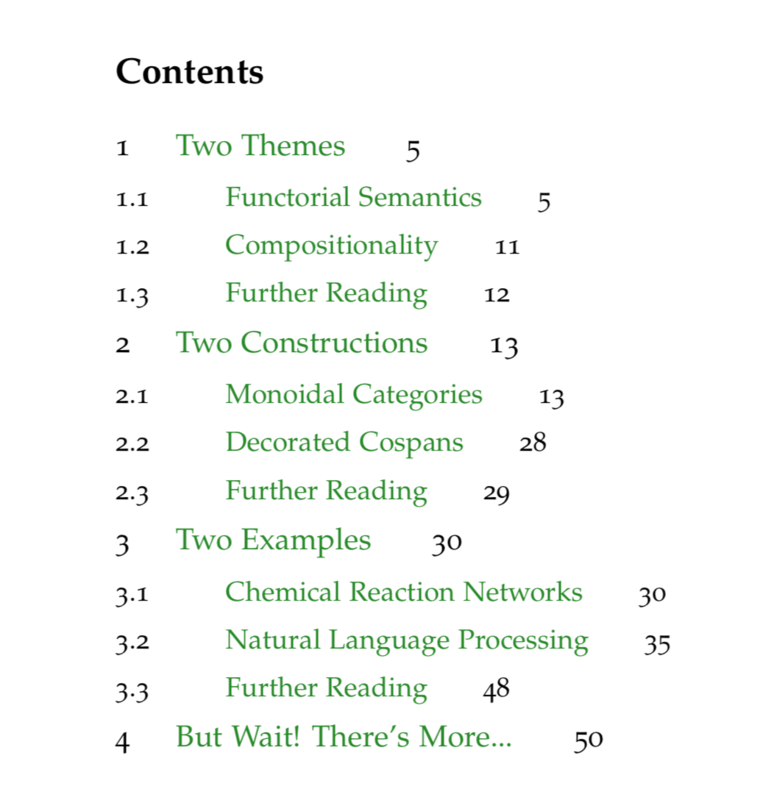 Most of what I’ve read on chemical reaction networks (as well as ecological, social and economic ones) use math formalism at a much more basic level than category theory (i.e. differential equations, graphs, statistical mechanics ). CT most likely is much more general but there is a gap—most people i know don’t even use calculus (at least explicity) to understand that a banana is a fruit (one applied example in the book). Chimpanzees don’t either. It’s a big wor(l)d.
Category theory at the level currently being used for chemical reaction networks is far simpler than the study of the nonlinear differential equations that describe the behavior of these networks. The real numbers are a complicated structure to begin with, proving existence and uniqueness for nonlinear ODE is harder, and proving the interesting qualitative results for chemical reaction networks like the deficiency zero theorem takes a reasonable amount of work after that. Categories are just dots and arrows. What’s true, however, is fewer people learn about categories in school—so they think categories are scary. Books like Tai-Danae Bradley’s are changing that.